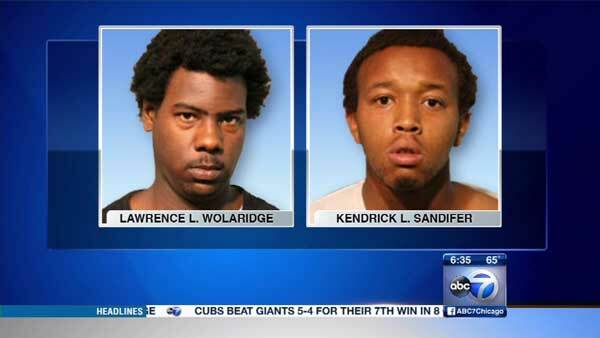 CHICAGO (WLS) -- Two men were charged after police said they tried to steal a woman's purse in Chicago's Lakeview neighborhood. Police said a 33-year-old woman was walking in the 1600-block of West Addison Street around 12 a.m. Thursday when the pair approached and tried to grab her bag. There was a brief struggle, but the woman managed to hang onto her purse. The pair ran away empty handed. Officers canvassing the area spotted the two men on Paulina Avenue. Kendrick Sandifer, 19, and Lawrence Wolaridge, 22, were arrested after a short chase. Sandifer, of the 5300-block of West Hirsch Street, and Wolaridge, of the 1200-block of North Lincolnwood Avenue, were each charged with attempted robbery. They are due in bond court on Friday.